The Hindustan Aeronautics Limited [HAL] HF-24 Marut fighter-bomber was built in India, based on a design by Kurt Tank, famous for his Focke-Wulf aircraft built for Germany during WWII. The HF-24 Marut ["the wind"] represents the moderately successful attempt by Hindustan Aeronautics Limited [HAL] to design and build a jet fighter. The Marut featured a small swept wing and excellent maneuverability. It had limited combat potential because of the low engine power, and could barely reach supersonic speeds in level flight. The first prototype flew on June 17, 1961, with a total of 147 aircraft built, including 18 two-seat HF-24 Mk 1Ts. The fighter was eventually short-closed because of an under-powered engine and a lack of foresight. The Marut continued in service with the Indian Air Force until the aircraft was decommissioned in 1985. The Marut became emblematic of the Nehruvian emphasis on industrial and economic self-reliance, deemed especially important in the realms of defence industries. Next to Ashok's (B.C. 250) edicts at Girnar in Kathiawar and Sopara near Bassein in Thana, the Nana pass inscription is the oldest writing in Western India. It is believed to be the earliest historical record in the Deccan, and has the special interest of being the oldest known Brahmanical inscription in the whole of India. In the beginning salutations are offered to Vedic and Puranik gods, to Dharma and to Indra, to Chandra the moon, Surya the sun, Agni fire, and Marut wind, to the four region-guardians or lokapals who preside over the four quarters of the universe, Yama, Varuna, Kubera, and Vasava, and to Sankarshana Krishna's brother and Vasudeva or Krishna. India entered the aviation business rather late. Seth Lalchand Hirachand established Hindustan Aircraft Limited (HAL) only in 1942. HAL's initial effort was to overhaul aircraft; but after Independence there was a boom in activity. HAL's first ever indigenously designed and built aircraft was the HT-2 piston engined trainer that flew in the late forties. The HT-2 was designed by a team led by Dr. V M Ghatge. Under Dr V M Ghatage's leadership, HAL developed and test flew HT 72, an ab initio trainer, in 1950. A large number of light aircraft such as the Pushpak and Krishak were developed and manufactured. The troika of P Nilakantan, V M Ghatage and Satish Dhawan worked together on dozens of national aeronautical committees, and virtually wrote the country's aeronautical R&D agenda for the future. Ghatge held very strong views on the direction, level and pace at which the Indian aircraft industry should operate and these were at variance with those held by the policy makers of the day. His step-by-step approach to develop the day signified a definite stage in the design knowhow in the country did not find favor with government machinery as the operational arm of the defence services became more demanding and the ministry decided to rely heavily on licence production. In the late fifties, the Government of India approved the launch of fighter aircraft development. This project was, however, assigned to a German team under Kurt Tank and many of the Indian designers trained and nurtured by Ghatge were transferred to this project. This caused a kind of split in the design department. This was a source of great unhappiness to Ghatge since he had assiduously developed a design team to take on more challenging tasks under him as the years rolled on. Later on, an integrated design organization was restructured at HAL but by then Ghatge had left HAL. Dr. Kurt Tank, a contemporary of Willy Messerschmitt (the OTHER aviation genius of the twentieth century) was by far one of the most influential aircraft engineers to ever live. The Focke-Wulf Fw 190 is regarded as one of the best fighters of World War II. Designed by Kurt Tank, it first saw combat in the summer of 1941 and went on to be produced in several variants. At the end of WWII, Kurt Tank immigrated to Argentina. Like many other German technicians, Kurt Tank continued his professional life in Latin America. The Argentine Government offered him a job at its aerotechnical institute, the Instituto Aerotécnico in Cordoba. He moved there, like many of his Focke-Wulf co-workers, in 1947. The Instituto Aerotécnico later became Argentina's military aeroplane factory, the Fábrica Militar de Aviones. There, Kurt Tank designed the Iae Pulqui II based on the Focke Wulf Ta183 design that had reached mock-up stage at the end of the war. It was a state-of-the-art design for its day, but the project was cancelled in 1953 due to Argentina's financial crisis. He followed up this design with the IAe.43 Pulqui III. In January 1955 Kurt Tank's contract came to an end. He asked Argentine President Juan for an amount of money almost the double of what he had received under the former contract. Peron rejected that and Tank left. When Peron fell from power in 1955 the Focke-Wulf team dispersed, many to the United States. In 1956 the Indian Air Force's request for a homeproduced fighter/bomber - forcefully promoted by the late Air Marshal S. Mukherji - received the backing of the then Defence Minister, Mahavir Tyagi. Accordingly a design team, headed by Dr Kurt Tank, former technical director of Focke-Wulf, started work on the design of India's - and perhaps Asia's - first supersonic fighter aircraft. In 1957, Prof Kurt Tank was invited by the Government of India to join Hindustan Aeronautics Limited (HAL) in Bangalore. Tank went to India with a smaller team than he worked with in Argentina, of eighteen German engineers and technicians, which number later dwindled to thirteen. The team initially consisted of 18 German engineers, three Indian senior design engineers and about 22 other Indian engineers with design experience. Given the small number of Germans in India, unlike the Argentinean experience, in India local engineers and technicians took responsibility for production engineering, tool design, and manufacturing activity leading to a successful international technology transfer. Within 22 months glider trials were started to test in free flight the full-scale wings and fuselage which had already been model-tested in wind tunnels. Low-speed behaviour was explored in the tunnel of the Indian Institute of Science at Bangalore. The staff had further been increased by this time, the design team having grown to 80 Indians with the same complement of Germans. Assembly of the first prototype was started in April 1960, and it was finished in 11 months - an excellent period considering that HAL were dealing with an aircraft of such advanced design for the first time. In the words of the Indian Government, "It speaks volumes for the enthusiasm and zeal of the production engineers and the workmen." In March 1961 the prototype, serial number BR462, was completed and ground trials were started. These trials are necessary to determine the ground handling qualities of a newly designed aircraft, and to check the functioning of various systems before undertaking the maiden flight. The latter came on June 24, 1961. The HF 24 Marut, was a twin engine fighter-bomber designed to reach supersonic speeds. A photograph of a wind tunnel model of IAe.43 Pulqui III makes it very clear that the Marut was based very closely upon that design. 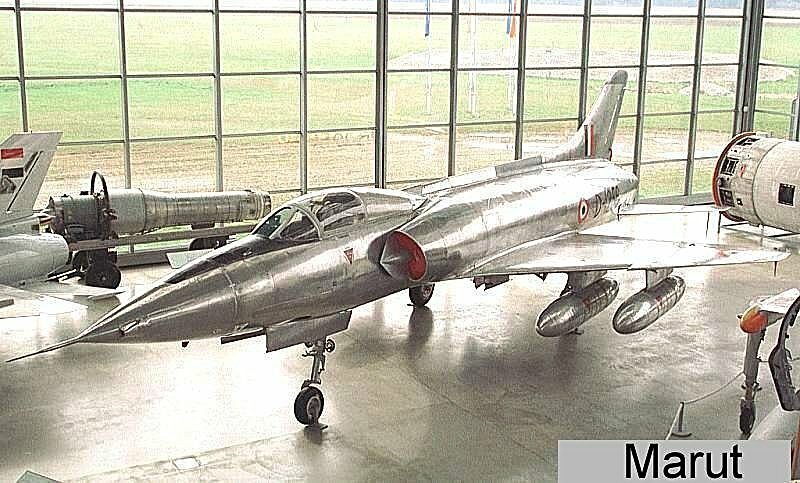 The Marut Mk1 Fighter of 1964 was a single seat ground attack fighter with 4X30 mm guns, internal rocket launchers 4 underwing hard points for drop tanks/bombs/rockets. The HF-24 had highly swept wings, a needle nose and a graceful, area-ruled fuselage. It incorporates many advanced aerodynamic concepts which make its flying safe and easy at low speeds as well as at supersonic speeds. While the elegant lines of the HF-24 Marut were clearly seen, the full potential of this exquisite design was never realised owing to under-powered engines.Power was provided by a pair of Bristol Siddeley Orpheus 703 turbojets, manufactured under licence by Hindustan Aircraft Ltd. HAL's Aero Engine Division were the first organization in Asia - outside the Communist countries - to manufacture an aircraft gas-turbine. The Orpheus licence was concluded in September 1956, when the Indian Government also procured a licence for the manufacture of the Folland Gnat Mk 1 fighter. The Gnat Mk 1 engine is the Orpheus 701, rated at 4,7001b thrust, and identical to the British-built unit. HAL's engine factory was completed early in 1959, the first Orpheus 701 came off the line on November 21, 1960, and type approval was granted by the Indian Defence Ministry nine months later. Discussions between Bristol Siddeley and the Indian Government were held in 1960 and 1961 with a view to completing development of the Orpheus 12, or of continuing development of the much later BS.75 turbofan as a possible HF-24 powerplant. These talks did not lead to a satisfactory conclusion. In 1961 the Soviet Government was approached to investigate the possibility of fitting the HF-24 with a Russian powerplant. Six RD-9F turbojets were imported by the Indian Government in 1961 and bench-tested in that year and in 1962. Ultimately it was concluded that these engines would not be the best answer. One reason for the decision was the fact that the development potential of the RD-9F could not be extended beyond about Mach 1.5 without changes in materials and other specifications, whereas the HF-24 was regarded as potentially a Mach 2 aircraft. Another reason was that the Indians found it impossible to obtain from the Soviet Union the necessary level of detailed information on manufacturing the RD-9F without which they could not have produced it themselves. By 1963 the decision had been taken to adhere to the Orpheus 703 engine as the basic powerplant of the Maruta Mk 1, but to do everything possible to increase its performance. The Orpheus 703 reheat made use of Bristol Siddeley techniques and advice, but was basically a product of HAL's Engine Division and reflects that organization's steadily growing self-sufficiency. The Orpheus 703 Reheat, as the engine is known, had a maximum rating in the 6,500 to 7,0001b class. A three-squadron batch of the just-supersonic Maruta Mkl ground attacker was built with Hindustan-made Orpheus 703R engines, with an afterburner of HAL design. The Government was unwilling to sanction Rs 5 crores to Bristol Siddeley for development of the afterburning follow-on engine to the Orpheus 703 as its power plant. In 1964 an Indian mission visited Cairo to assist in the flight testing of the Egyptian E-300 turbojet, developed by a team under the Austrian Prof Ferdinand Brandner, for the indigenous HA-300 fighter. Indian assistance centered on the supply of a Hindustan HF-24 Maruta airframe for flight testing the E-300. The Indian Government was interested in the Brandner engine as a possible powerplant for the planned supersonic Maruta Mk2. By late 1964 there were reports that an agreement had been signed whereby the two countries will jointly produce a supersonic fighter. India would make the airframes and the UAR the engines. It would not appear illogical for the combination to be continued in production, as the Indian airframe is more capable than the UAR's HA-300. The HF-24 could not achieve its designed performance without a more powerful engine, causing serious setback to the fighter's development and for that matter, the future of developing a substantially self reliant aircraft industry. In this situation, the Air Force continued to buy outright or take up licenced production (through HAL) of aircraft needed by them. Delay in availability of the HAL-designed HF-24 Marut for the ground attack fighter mission led, in 1966, to the IAF evaluating and the Government purchasing the Sukhoi Su-7BM, deliveries of which from the Soviet Union were to commence in March 1968, with No.26 Squadron being the first of a half-dozen squadrons that were to operate the type. Numerically predominating in the fighter inventory by 1968 was the Gnat, equipping eight squadrons; six squadrons were equipped with the Hunter, a further four on the MiG-21FL and two on the Mystere IVA. Two squadrons fulfilled the photo-recce fighter role with adapted Vampire T Mk. 55s and one squadron was operating the HF-24 Marut. 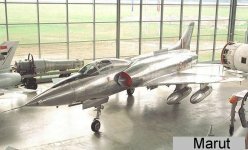 The first of the production Marut trainers on order was delivered to the IAF by late November 1974. The tandem-seating HF-24 Mk.1T trainer could well have fulfilled the advanced jet training requirement of the IAF. The Mk.II prototypes had completed all flight testing required (over 300 test flights) by the end of 1974. The HF-24 Mk-II proposal was virtually rejected by 1974, as the Indian Air Force had not confirmed its initial interest in the afterburning Orpheus 703. HAL have submitted proposals for the Mark III, or HF-73, and this aircraft would reportedly exhaust the growth potential of the HF-24. The HF-73 would have maximum hardware commonality with the HF-24 and if GOI sanction is received within 1974, the aircraft was envisaged as entering squadron service in 1981-2. Given the limited number of Marut units, most Marut squadrons were considerably over-strength for the duration of their lives. According to Brian de Magray, at peak strength No.10 Squadron had on charge 32 Maruts, although the squadron probably did not hold a unit-establishment of more than 16. All in all, the Marut squadrons acquitted themselves very well in the 1971 war. The Marut, as an aircraft, was shown to be tough and capable. No aircraft were ever lost in air-to-air combat. However, 4 were lost to ground fire and two were lost on the ground. The Maruts were in the thick of it, right through the fighting on the western front, and the Squadrons ended the war with a total of three Vir Chakras. The next requirement to be met in the mid-1970s was for a Tactical Air Strike Aircraft (TASA). With the various development programs to enhance the operational performance of the HF-24 Marut by HAL abandoned for one reason or the other, the Government of India concluded an agreement with the Soviet Union for the MiG-23 variable-sweep fighter. Four squadrons, then flying the HF-24 and Sukhoi Su-7 were re-equipped with the MiG-23BN and induction into IAF service of this swing-wing fighter. Development of the HF-24 underlined the importance of developing engines as an essential precursor for fighter aircraft development. One of the consequences of the HF-24 development program was the awareness that if India did not have a strong R&D base, it would not be possible to achieve any self-reliance. This awareness resulted during the late 1950s in creation of the Aeronautical Development Establishment (ADE) and the Gas Turbine Research Establishment (GTRE) under the Defence Research and Development Organisation (DR&DO), as also the National Aeronautical Laboratories (NAL) under the Council of Scientific and Industrial Research (CSIR), being the R&D organisations to back aircraft development activities in HAL. Along with development of the HF-24 was proceeding under Kurt Tank, HAL took on the concurrent responsibility for design, development and series production of the jet trainer HJT-16 Kiran. This was the first major attempt made by HAL to design and develop a jet aircraft on its own without any foreign assistance in its design. 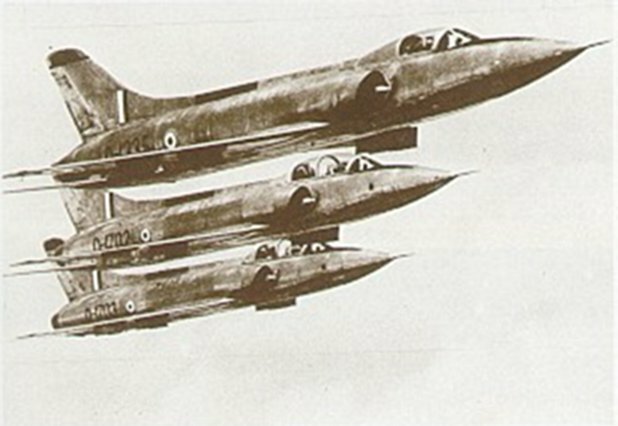 As the sixties translated to the seventies, the IAF consolidated its expansion plans, attaining its 45-squadron goal. Obsolescent equipment was steadily withdrawn to be succeeded by increasing numbers of HF-24s, MiG-21FLs and SU-7BMs. Indian planners anticipated that any future war with Pakistan would be a high-intensity, short-duration affair (partly because of diplomatic intervention by third parties). Consequently, the IAF developed a powerful tactical strike force to facilitate rapid advances by ground elements. Offensive air support would be furnished by MiG-23BN and MiG-27 squadrons, augmented by the MiG-21M Fishbed-J and Ajeet (an upgraded version of the British Gnat). As of the mid-1980s aging Hawker Hunter Mk 56 and Sukhoi Su-7 fighter-bombers were being removed from the inventory. The HF-24 Marut served until 1985. The various development programs to enhance the operational performance of the HF-24 Marut by HAL were abandoned for one reason or the other. The Government of India concluded an agreement with the Soviet Union for the MiG-23 variable-sweep fighter to meet the Tactical Air Strike Aircraft (TASA) requirement. Four squadrons, then flying the HF-24 and Sukhoi Su-7 were re-equipped with the MiG-23BN. Initiating an indigenous design and development of an aircraft or a helicopter requires large amount of funds. It is not feasible for HAL to initiate a major project without the firming up of specification and requirement by the domestic customer and funding by the customer/Government. HAL was not entrusted with any major new design and development project of fighter aircraft after the HF-24 (Marut). Developmental activity resumed only in the 1980's.